Get off the sidelines and get into the game! Dance, art, travel, lifestyle and more. No limits! 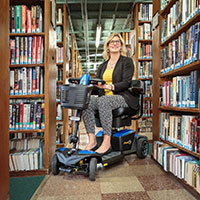 Abilities ambassadors hale from all corners of the disability community. They are leaders, writers, artists, entrepreneurs, veterans, athletes, celebrities, advocates and parents to special needs kids, and they may have just the answers you are looking for. If you have a story to tell to the disability community, then we want to hear it! It could be an informative article on the range of subjects featured to the left. It could be meaningful advice base on your wealth of experience. It could be serious or entertaining and conveyed through words, video or images. It just has to be your story. Learn about the event for the disability community. Three days. One roof. Endless opportunities. Discover the latest tech, workshops, dance, sports, service animals and more! Come for the products! Stay for the fun! 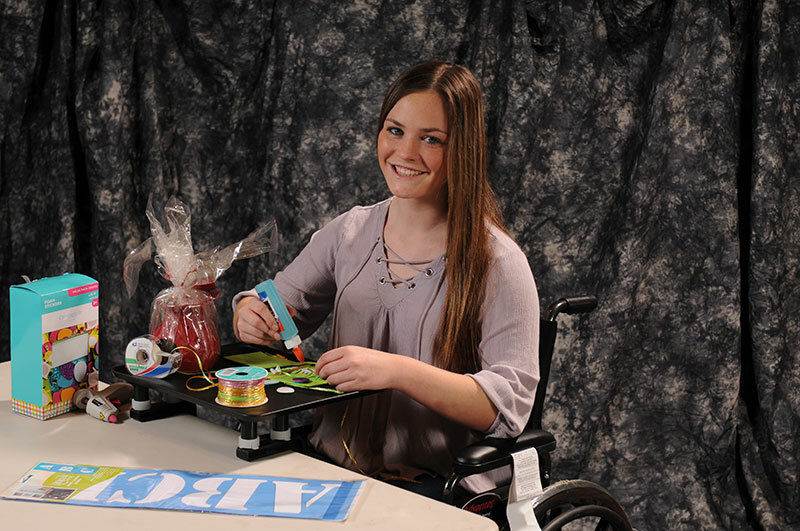 Cutting-edge products, education and fun to bridge the gap between ability and disability. Meet new friends. Talk with experts. Fun for the whole family! Even Abilities Expo is Bigger in Texas! With so much to see and do, one attendee called it Disability Wonderland! Abilities Expo expands north! Great News, Eh? Wheelchairs and restaurant tables don't mix. If you are someone who depends on a wheelchair for mobility or a family member of someone who uses a wheelchair, you know how difficult it can be to go out and eat. Typically, the wheelchair doesn't get close enough to the table and the person has to reach to get to their plate, often slumping over. Regrettably, this causes a lot of drops, spills and messes. That is, until the Portable Tabletop Extension by Quality Of Life Products came on the scene. Research shows that Americans with disabilities have more than $220 billion in disposable income; 71% eat out at least once a week and more than 78% are accompanied by another adult. On one side, restaurant owners are always in need of new, long-term customers. On the other hand, wheelchair-using potential patrons want to dine at the restaurants. What seems to be the problem? It's the tables!!! 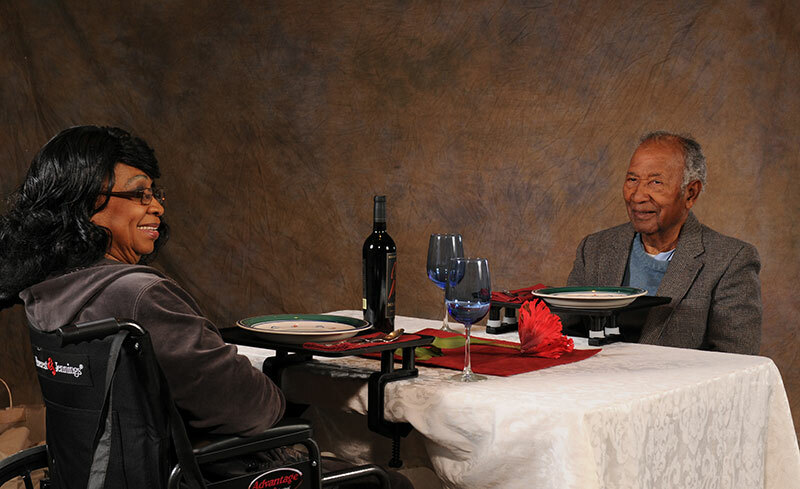 Restaurant tables, as well as the tables at home, were not designed to accommodate wheelchairs. The simple and almost universal solution is the Portable Tabletop Extension. The PTE is a durable, lightweight device that elevates and extends the eating surface over the lap to give the person the space needed for a more confident, safe and comfortable dining experience at virtually any table, at any restaurant or at any home. Going out to eat is more than just getting a meal. It is one of the ways that we connect with our family and friends. The PTE facilitates this positive engagement and promotes independence and self-confidence. The PTE was first conceived by a man who wanted his son with Muscular Dystrophy to be able to enjoy a meal with the family at the dining room table. That son, Curt Austin, became an ADA consultant, helping many in Nevada's hotel industry develop strategies and plans to accommodate visitors in wheelchairs. He saw first-hand the widespread need for his father's invention. Austin and childhood friend Anthony Morrison joined forces and transformed PTE from the initial prototype of wood, wire and screws to the attractive, easily portable device that blends well in almost any restaurant setting. "Curt and I were poised to bring the PTE to the next level when he got sick," said Morrison. "On one of my visits to him, he asked me, 'If anything happens to me, will you finish this?' I said, 'Of course. Yes, God willing'." Austin passed away in June of 2010. True to his promise, Morrison launched Quality Of Life Products, LLC five years later and began to produce the PTE in his honor. Completely American-made, the Portable Tabletop Extension is manufactured in Fresno, California and assembled by workers with disabilities at the ARC – Fresno. It is made of high-impact plastic, weighs about a pound and comes complete with its own storage bag. The PTE is very user-friendly and takes less than 30-seconds to assemble and attach to the table for use, and less than 15 seconds to break down. 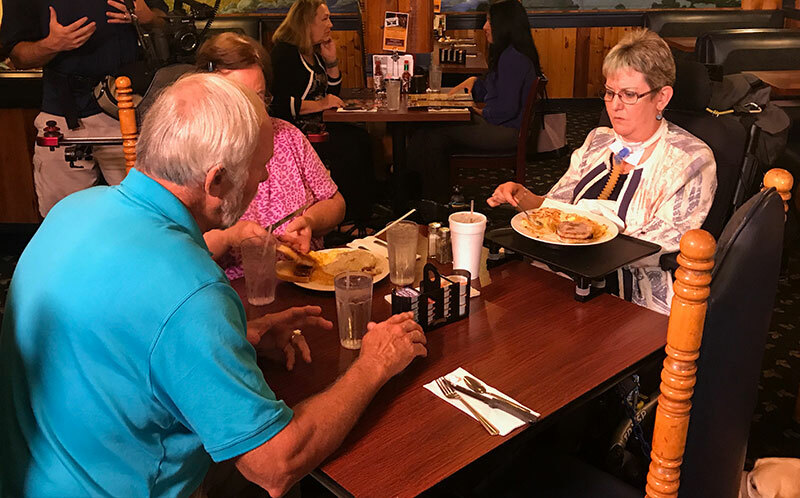 The "Plate Rotator," a Lazy Susan-style accessory, is designed for those whose upper limb mobility issues make it difficult to turn or reach across the plate. The ADA strives to give every citizen the opportunity to benefit from the goods and services that businesses offer, as well as helping companies thrive from the patronage of citizens of all abilities. The PTE provides the mandated clearance for the knees of wheelchair users, drastically improving the accessibility of restaurant tables, counters and even the breakroom at work. "Our company's earnest desire is for all individuals, wherever they may be, to be treated as equals to the greatest extent possible," said Morrison. "Our aspiration is for every person to grow and progress by taking advantage of opportunities and by overcoming any restrictions, including physical disabilities. In every individual, we want to promote courage and confidence to enjoy life to the fullest extent possible." Morrison added, "If our products deliver a small amount of liberty and inspire individuals to demand more out of their lives, then we will have done our job." Find out more information about the PTE, visit www.adltray.com or www.yourqualityoflifeproducts.com, or call (559) 460-3090. Pre-Register for Abilities Expo Today...It's Free! Come see us at Abilities Expo and test ride. American Sign Language interpretation services will be available at Abilities Expo. © 2019 Abilities.com. All rights reserved. Disclaimer.